Zero (iOS)’s simple yet effective user flow. Don’t eat anything for the next 18 hours. If you’re shocked at the absurdity of this suggestion and wouldn’t even wish it as a punishment for your worst enemy, then you probably haven’t heard of intermittent fasting. Intermittent fasting (I.F. for short), is not a diet, but a pattern of eating where you cycle between periods of fasting (most commonly 16 to 18 hours a day) and non-fasting. The protocol doesn’t dictate which foods to eat, but rather when you should eat them. While it has been around informally forever, I.F. came into the mainstream in 2016, after Professor Yoshinori Ohsumi was awarded the Nobel Prize in Medicine for his research on the role of autophagy (i.e. how cells break down and regenerate) in life longevity. You might ask “Why would anyone choose to do this, when food tastes so good?” There is increasingly stronger evidence in the scientific community that I.F. can reduce one’s risk of Type 2 diabetes, neurodegenerative diseases(e.g. Alzheimer’s and Parkinson’s), and cancer. Other studies have shown that I.F. can even improve various cognitive functions, all while having much higher compliance rates than traditional calorie-restrictive diets. The following is a product analysis of Zero, a free iOS and watchOS app that helps people track and thus better adhere to their intermittent fasting schedules. I will explain why this app delivers a delightful user experience, suggest how it can be further perfected, and offer potential monetisation mechanisms that will lead to a sustainable, world-positive business. Zero is currently on Version 2.4.7. This next section of my product analysis deals with a hypothetical: If I were the product manager tasked with delivering the next, much-anticipated release of the app, which features would I build and why? How do I take an already great product to the next level? First, I need a “North Star” (i.e. where am I going?). The user presets her goal for the how long she plans to fast (Zero recommends 16 hours to begin with). As such, how engaged users are with the app can be evaluated by a Key Performance Indicator (KPI) like “number of goal-surpassed days per user per month”, for instance. Every change I’d make needs to be in service of increasing this specific metric. Left-top: Photoshop, Left-bottom: Duke’s room reservation system, Right-bottom: iMessage, Right-top: where we’re taking Zero 3.0! Whenever I’m specifying requirements for a product, I constantly remind myself of the product lesson I learned from Andrew Ofstad (CPO at Airtable). If we rate products along two dimensions, from simple to sophisticated functionality and from simple to complex user interface, we can place them in a 2×2 matrix. The products with simple functionality but complex UI are plain bad, forget them. Some products will sacrifice UI simplicity for added functionality (e.g. Photoshop, products here are often considered “pro” tools) while others will do the opposite (e.g. iMessage, does one thing really well). 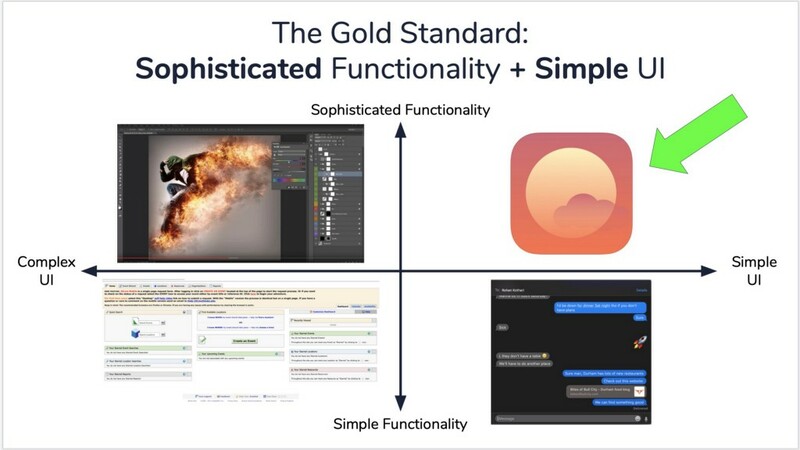 The pinnacle of product design lies in the remaining quadrant — sophisticated functionality underneath a simple UI. There are very few products out there that I’d confidently place here, but Google Maps, Airtable, and Notion are excellent examples. To elevate Zero into this Goldilocks zone, we must find ways to implement the following functionalities in unobtrusive ways. I’ve identified the following 3 possible “low-hanging fruit” features (i.e. greatest value added to app per unit of development effort). These are, in my opinion, simply table stakes for consumer apps in 2019. More visual layout of the “Science” page: Currently, the resources are simply web links that are opened up by an in-app browser. Zero could make this more aesthetically-pleasing by replacing text with images or graphics whenever possible. The current layout of Zero’s science page is visually uninviting. Aaptiv’s image-first approach would be better. 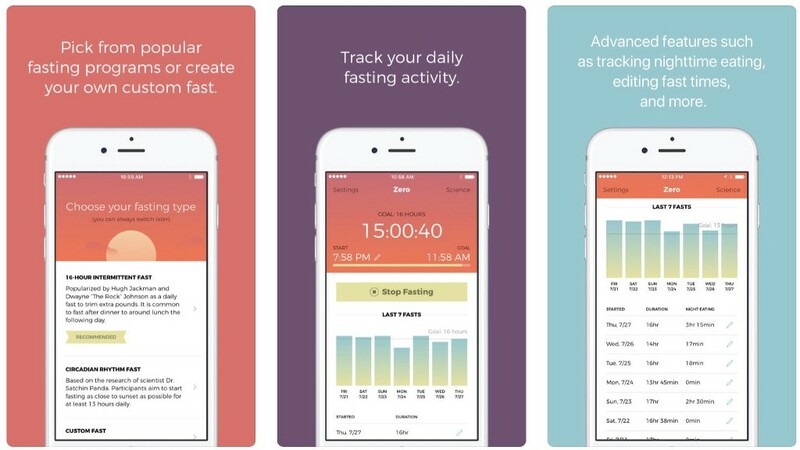 Longer history viewable in-app: Only the past seven days of fasting information is viewable. Historical data is maintained by Zero, but the only way to see it is to export as .csv file, which is not something either the “Rookie” or “Patient” personas would bother doing. Simple solution: a “See More” button at the bottom. Referral link: Make it easy to invite others to join Zero (text, email, or just a link). Trigger (external): send push notification at your normal dinner end time (hopefully with repetition, this trigger will later be internalised to a habit of opening Zero after eating). Variable reward: This stage is the biggest challenge for Zero as the reward of I.F. is inherently long-term. One thing I might try is displaying a motivational affirmation or challenging the user to“buy-in” (we dislike disappointing ourselves after we’ve explicitly committed to something). 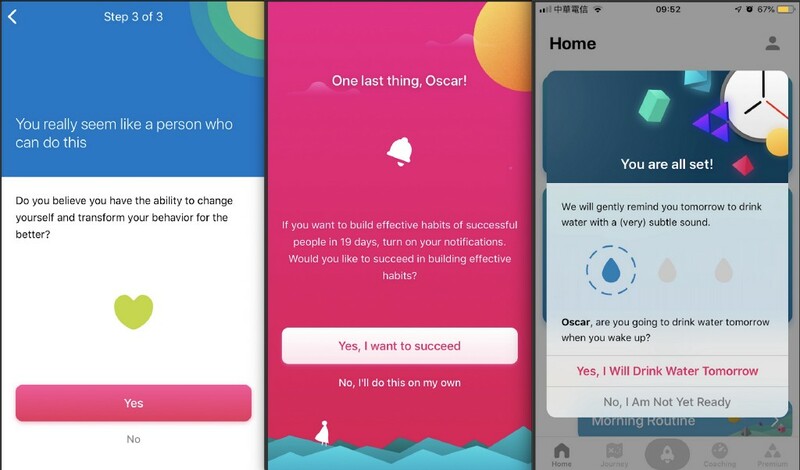 The Fabulous, a “Life Coach” app designed by Duke professor Dan Ariely’s Behavioral Economics Lab, uses various behavioural psychology techniques to increase the user’s commitment. Investment: A simple text journal entry (e.g. asking “What did you eat? How do you feel?”) attached to the completion of each fast. Over time, user begins to see his qualitative health patterns, thus deriving even more value from Zero. Streaks:A recognition of consecutive I.F. days with fun badges at milestones. 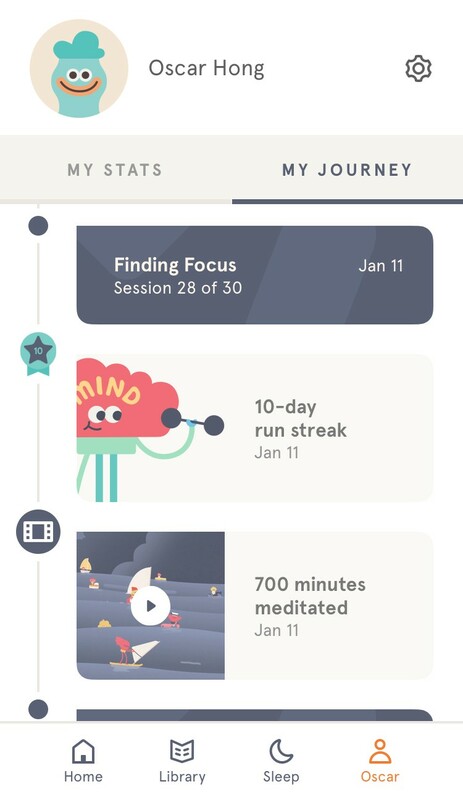 Headspace’s streak interface and playful badges is an example of gamification done right. Private support community support: I often set up self-improvement group chats around building specific habits (e.g. waking up early, meditating, etc.) The same mechanism for social accountability fits right in with an app like Zero. 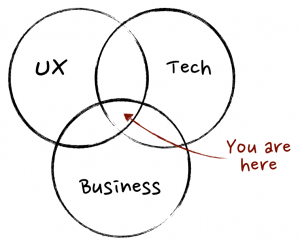 So far we’ve covered design and tech, but what about business? Source. In 2018, it was announced that Zero closed a $1.2M in seed round, marking its end as Mr. Rose’s pet project. Here we’ll explore three potential business models and one strategic partnership that can justify the startup’s turn onto the venture fast track. Freemium: The most straight-forward path to generating revenue would be to keep the bare-bones feature set as is for the free version and to create a “Pro” tier with more advanced features such as food logging, educational content, and integration with wearable devices. Another incentive to upgrade can be new UI themes. While a purely cosmetic change may seem to some like a silly thing to pay for, we’ve previously established that this is in alignment with the values of Zero’s target users. Bear is an app that has executed this angle well. B2B2C: Zero can sell directly to corporations by framing itself as an employee health and wellness benefit. In 2018, the total average per-employee cost for health insurance benefits (includes premiums and out-of-pocket costs for employees and dependents) was $14,156 (of which employers cover ~70%). If Zero can show that I.F. reduces the number of doctor’s visits or medication required by a non-trivial delta, they stand to offer a compelling value proposition. Insurance coverage: In a similar vein as above, FDA approval would pave the way for I.F. programs to be covered by health insurance. 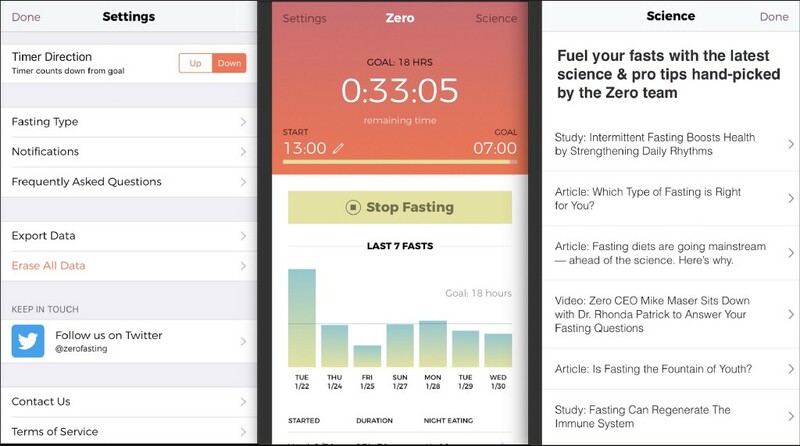 Zero should begin seeking Food and Drug Administration approval to become the first prescription fasting app for certain chronic illnesses (e.g. studies have shown that I.F. could make chemotherapy more effective with fewer side effects). M&A with leading health & wellness startup: In the battle between Headspace and Calm for the $1.2B meditation market, Zero may be an attractive acquisition target for both players as the integration of I.F. could help reposition them from meditation apps to all-in-one preventative healthcare solutions. At first glance, Zero may have seemed too simple of a product to be worthwhile of a comprehensive design, tech, and business deep dive. 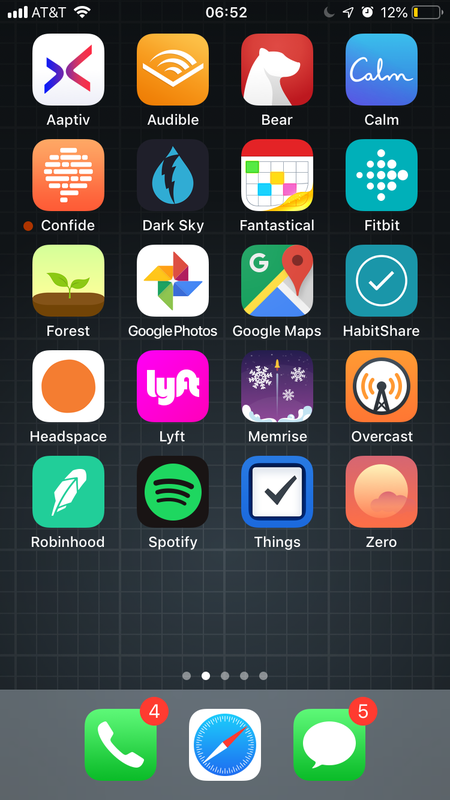 By following my analysis, however, I hope you came away with an appreciation for the app’s design clarity and focus. With rising obesity rates, the increasing convenience of food delivery, and our sedentary lifestyles, it is no exaggeration to say that we are facing slow but deadly health crisis. By marrying technology with behavioural psychology, I truly believe that a future version of Zero can have an outsized impact on society and direct us all to lead healthier and happier lives. For this reason, Zero continues to hold a coveted spot on my phone’s home screen. Disclaimer: Always consult your doctor before trying intermittent fasting. 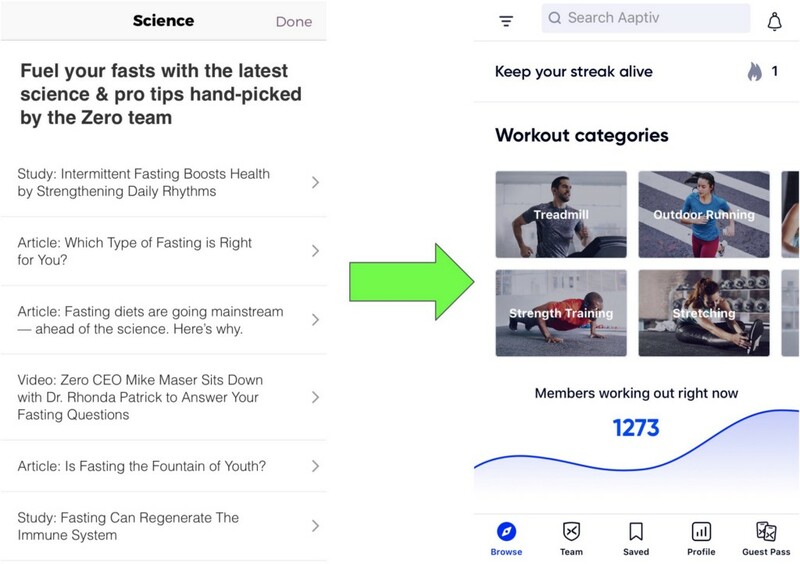 How Zero Wins: Product Analysis of the Fasting Tracker was originally published in Hacker Noon on Medium, where people are continuing the conversation by highlighting and responding to this story.